It’s a holiday weekend, so what better way to bring in the weekend than breakfast with friends? We love this recipe not only because it is so easy, but because you can jazz it up with fresh fruit, non-dairy cheese, anything you want! A delicious 3-ingredient vegan scone recipe your friends and family will love! Sift together the flour and sugar in a medium sized bowl. In a small bowl mix the canned coconut well. Pour coconut milk and the strawberries into the flour mixture and stir until ingredients are just combined. Pour mixture onto a lightly floured board and knead very lightly until the mixture comes together. It should not be sticky. You can now form the mixture into a round 2” high circle and cut it into triangles, or you can simply break off pieces of the mixture and form rustic shaped scones as we did. Place the scones on a parchment lined baking sheet. 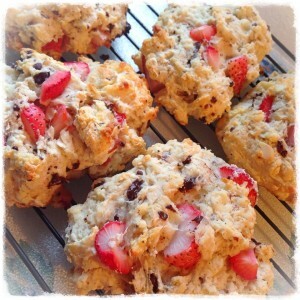 Brush the tops with coconut milk and bake for 15-17min or until the scones are lightly golden and done.